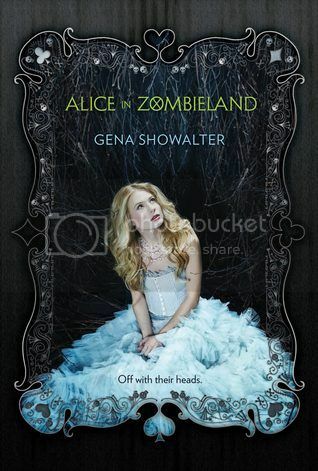 Alice in Zombieland is book #4 in my Halloween Reads Week! I’ve been simply dying to start this book because it sounds pretty amazing, and has gotten really great reviews. Plus, it’s a Harlequin Teen novel, and I never regret reading one of their books. The main character in the story is Alice Bell. I didn’t really know what to expect from Alice going into the story. I worried that with everything that she had been through, that she was going to be a weak character. I’m super glad to say, Ali totally proved me wrong. Instead she stayed strong and held her ground against the people who wanted to bring her down. I loved her snarky attitude. Ali’s love interest in the story is bad boy Cole Holland. Cole is the tattooed, smexy hot guy that I have come to love in my books. The relationship between these two characters was trying at times, but once they finally give into each other, they are absolutely perfect together. I have to say that I really love the secondary characters in this book as well. Ali’s best friend, Kat, was a hoot. She definitely made the book more enjoyable for me, even though she was slightly mysterious. I also really love Ali’s grandparents; they were so cute and tried so hard to be ‘in the know’ about their granddaughter. Their use of ‘teen slang’ was pretty comical. I found all of the kids in Cole’s little group to be pretty interesting as well, each for their very own reasons. I’ve read the Alice in Wonderland books by C.S. Lewis. However, I started Alice in Zombieland not even thinking about this book as an actual retelling. Yes, there were a few references to Alice in Wonderland, but only a small few, and the story was enjoyable just the way it was written. Overall; this book was SO good! I enjoyed it so much more than I ever expected to, and now I’m dying to get my hands on the next book. I am going to try to get to it as soon as possible, because I need more Cole! Er, I mean… Alice, Cole and crew. Wink. I enjoyed this one so much more than I expected (loved the cover -- that's what drew me in). It was also different than what I thought it would be, which turned out to be a good thing. I've been looking for a good halloween to purchase for this month. Seems like I've found it. Great review! Can't wait for this.